The Aston Waikiki Beach Tower is the top of the line for two bedroom condominiums in Waikiki. Gourmet kitchens with cut crystal stemware and silver cutlery, wet bar, and large private lanais. Let the staff totally pamper you with twice daily maid service and much more. Spectacular views of Waikiki Beach and a 30 second stroll to the beach. The most upscale condominium complex overlooking Waikiki Beach. The Aston Waikiki Beach Tower offers spacious, well appointed condominiums where the emphasis is on personalized service. Located across the street from Waikiki Beach, guests of the Aston Waikiki Beach Tower enjoy peaceful respites from nearby shopping and dining in spacious and deluxe surroundings. Residences offer wide balconies offering spectacular sunset and ocean views. Depending on what floor they are located on, guests at the Aston Waikiki Beach Tower have partial or full ocean views. Amenities include full kitchen, wet bar and washer/dryer. 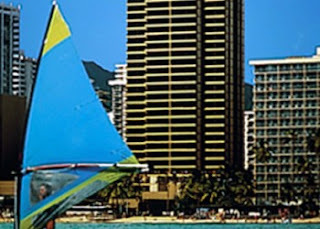 All of Waikiki's shopping, restaurants, and attractions are only a few minutes walk away from the Aston Waikiki Beach Tower. The Aston Waikiki Beach Tower is located across the street from Waikiki Beach. This is a very beautiful and populated beach. You can enjoy swimming, sunning, snorkeling and other activities. There is also the availability of restaurants and hotels that are located beachfront.